Is PrizeRebel A Scam, Or Legitimate Rewards Site? Last updated on January 2, 2019 By Nat 4 Comments This post may contain affiliate links. We appreciate you supporting Rags To Niches! Full disclosure here. Today I will be looking into PrizeRebel – a popular paid rewards website. Is PrizeRebel a scam – Or legitimate rewards site? I recently had a comment on another review I wrote telling me they’d made some reasonable money on PrizeRebel. Nevertheless, I signed up and checked it out. Stick with me and I will explain whether or not PrizeRebel is worth your time. Overall Rating: Legit. A good little paid-survey site, with a variety of options how to earn a little extra money on the side. A low payment threshold, so you won’t have to wait long before you can cash out. I call sites “all-rounders,” when you do not only earn money from taking surveys, but have a choice of other ways too. Normally via things such as cash offers, sweepstakes, watching videos or doing mini tasks. Does this mean you will earn loads of cash signing up? No, this is a small income opportunity, but it is a legit one and you can make a little extra money on the side here. 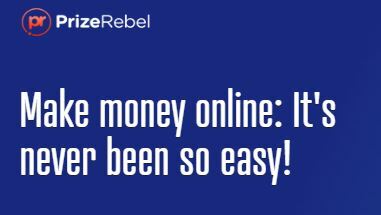 >> Join PrizeRebel For Free. PrizeRebel is free to join – all survey-related sites should be free to join and if they’re not, it’s generally a sign that they’re a scam. Sometimes people query why companies would be giving away money just for the answer to some simple questions. But paid survey sites are paid by companies to find out certain very specific information about potential customers. Information generated from market research can be essential in helping companies improve their businesses and generate better profits. The first thing I noticed on arrival to the site is that it’s not as sleek as some of their competition. However, it was very quick to sign up and once you’re actually inside. The homepage looks good and there is plenty of information and guidance there to get you on your way. Initially after sign up, there was a pop up with some tips on how you can immediately earn 85 points for a survey. They said it would take 15 minutes – it took me around 20. But I did get my 85 points without being chucked off, (not qualifying being one of the biggest problems with surveys). You can then choose various ways of earning a few extra points by learning how to use the site. Surveys are generally one of the most popular ways to make money via these sorts of sites. PrizeRebel has matched up with various providers and that ensures that plenty are available. 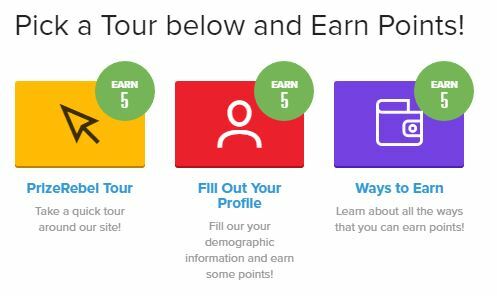 points that you earn per survey vary greatly. I saw surveys ranging from anything under 20 points, to over 400! Times to complete them ranged from just a few minutes up to around 25 minutes. (100 points = $1). Another way to earn includes completing cash offers, (which may involve signing up to a newsletter, joining a free trial, or downloading an app – for example) which generally pay considerably more than surveys. note about offers: I advise having a separate email address due to potential spam and having clear reminders to cancel free trials, which can easily end up in you being charged otherwise. You can also earn by watching videos, but when I reviewed the site, none were available to me at the time. In any case, you never get many points for watching videos, so it’s not the best option. This was also empty when I joined. Small tasks normally involve smaller surveys or conducting small amounts of research. They also run regular games and contests that you can sign up to for extra points, some will cost points to enter, (such as the raffle). There are also prizes for completing the most tasks, surveys, offers and generating referrals. You can also refer your friends and family – or many more if you have a large social media following, or website. For everyone you refer to PrizeRebel, you can make 20% of whatever they make, for the lifetime of their membership. You can cashout at a low minimum of $2 if you’d like an Amazon gift card, or $5 if you want to be paid via paypal. So, that’s really positive. There is also a large choice of rewards, including the usual ones you may expect such as Amazon, PayPal, prepaid visa, various department stores, itunes, restaurant cards and so on. 100 = $1, but I’m in the UK and is slightly different. So for a £2, you need 250 points, for a $2 gift card, it’s 200. What’s The Quickest Route To Cash? Without a doubt, the quickest way to make money on these sorts of sites is via the cash offers. The problem I’d have doing too much, is the amount of spam and making sure you cancel all those trial offers. There have been stories of people still being charged, even after they cancelled. So, it’s wise to keep a close eye on your account to make sure everything is correct and not sign up to anything without carefully reading the T&C’s. As I mentioned earlier, a second email address would be wise, as well as an auto-form filler such as autofill, (google chrome) or roboform – which makes filling in your details much faster. While Swagbucks is my favourite sort of these types of sites, the best way to make a return is to be members of several sites like this. A key difference between these two sites, is that Swagbucks has its’ own search engine, where you can earn points just by searching as you normally would. If you’re not into doing surveys or cash offers, getting paid-to-search via Swagbucks is a no-brainer. Since, it doesn’t require any extra effort on your part – aside from clicking through to their search engine. That being said, PrizeRebel does have plenty of the other similar elements of Swagbucks too and if you like one, you will probably like the other! While none of these opportunities will make you much money, they can give you a little bit of money on the side, varying on how much time you’re willing to put into them. One thing I’d like to see, is a PrizeRebel App!! Is PrizeRebel Worth Your Time? If you’re interested in these sorts of sites, where you can potentially earn a little bit of extra pocket money on the side then YES…. PrizeRebel is a legit website and fine for making a small amount of extra month on the side, without too much effort. >> Sign up for free here. They also have a low payout threshold, so it won’t be hard for you to see for yourself how it works and quickly see a return. Beyond Survey Sites – What Else Can You Do?! Some of the legitimate survey sites can provide a good way to make a little extra pocket money online, but they’re never going to add up to much! While some fake websites claim you can earn thousands a month from completing surveys, that’s not the reality. My plan online is to create multiple income streams, that will build up to something more substantial over time. One of those growing streams involves affiliate marketing and it’s great for beginners, I didn’t have any knowledge when I started. If you want to build up an income online – check out how to start a money making blog. You can also access some free training here. Have you checked out PrizeRebel… what do you think? Leave me a comment below! PrizeRebel is one of the best GPT site there is. This is what I used to think about Swagbucks. But after the last year earning opportunities on swagbucks has decreased a lot. I just love promo codes. I have earned more than 150 points just with promo codes. Hey there, thanks very much for your feedback. I haven’t checked out promo codes, I will have to look into it. Thanks for your comment! I hope you are having an excellent day. WonDough is one of the most popular and exciting websites that rewards user for day-to-day activities online. It would be great if you can feature an article on your website describing WonDough. We will reward you for the article accordingly for mutual benefits. Please let me know if you would be interested in this wonderful opportunity to be associated with WonDough. thank you for contacting me. If you’d like to contact me privately via my hire me page – with details and your rates, I will happily look into that for you.